Tonight I went to my church to take some pictures of the newly renovated OutReach Hall. Before I even went into the church, I was watching nature at it’s best. Before I even went there I have very much had my brain and heart on my upcoming trip to see my parents. My mom has stage 4 lung and colonrectol cancer. For many many years, I have gone to the church when I really need to pray and think things over. There is something peaceful about going there. Thankfully I have a key to the church, so it makes it very nice to know that when I need that quiet time alone with God that I can go there. Too bad it isn’t open to others who may have that same need. OK! So anyhow, back to my picture taking. As I was sitting there in my car and getting ready to take pictures of downstairs. I decided to start with updated pictures of the outside of church. It was close to dusk and the light that was hitting the church was pretty awesome. Also, there was birds around the church. 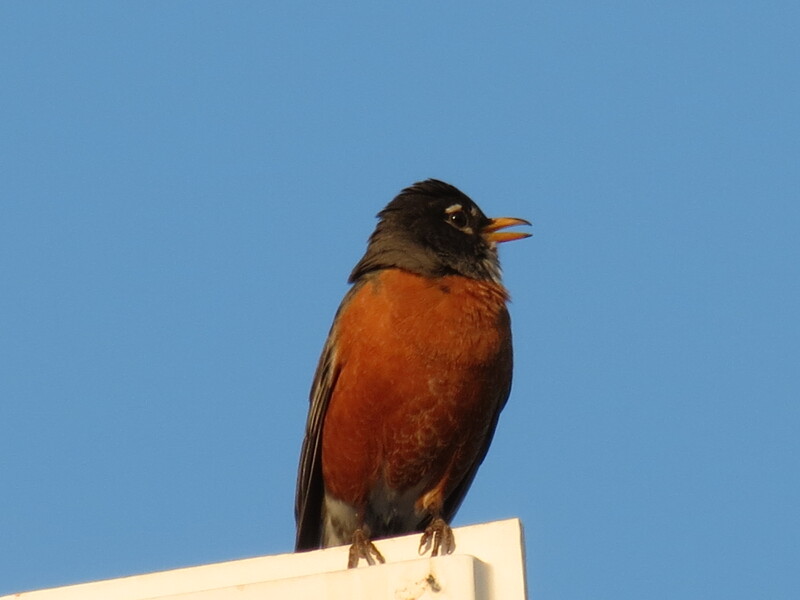 I noticed that there was a little Robin sitting on our churches steeple. We have a cross steeple. It was just sitting there and singing. He didn’t seem to have a worry in the world. Then to the right of me, I caught eye of a crow. It could have been a raven, not totally sure on that. 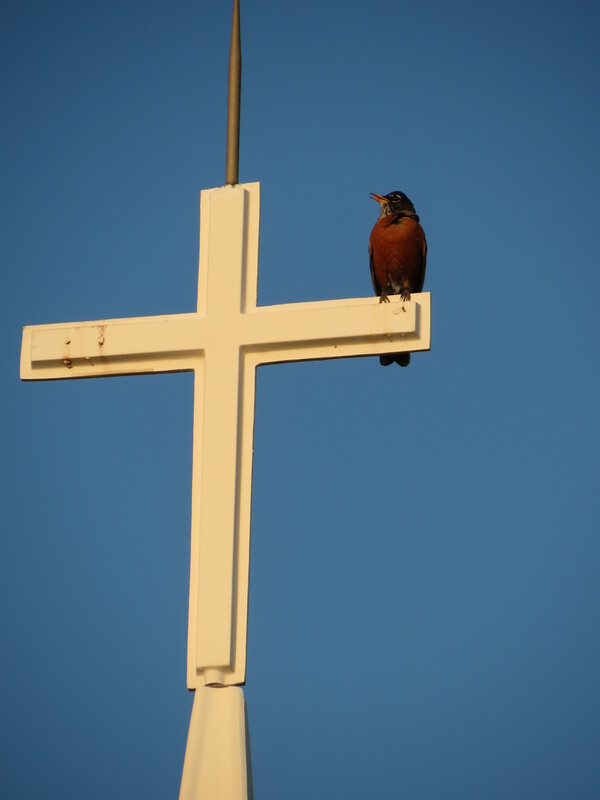 Here is this Robin that is singing to the top of it’s little lungs while sitting on the cross. He decides he wanted to go fly around and here comes the crows. They were out for blood and that Robin was about to be the prey. 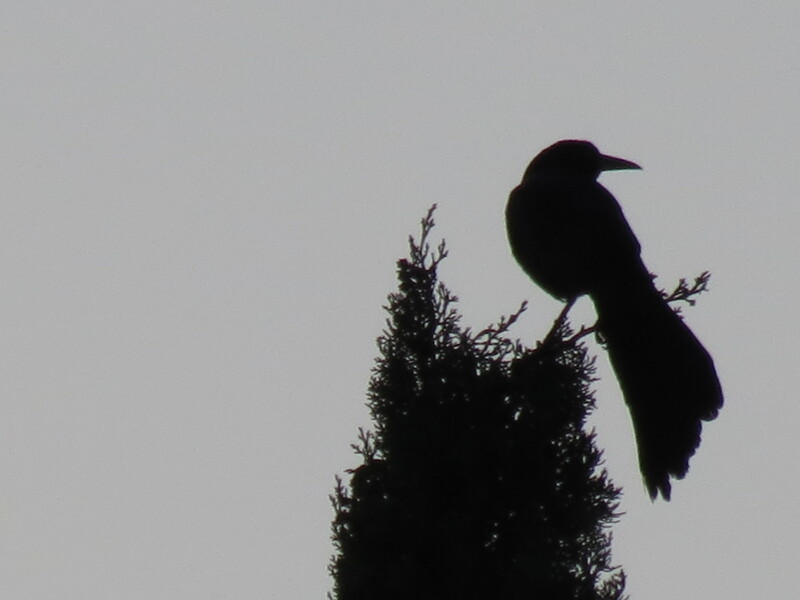 There are a few of the crows circling him. So he decides to fly back to the cross. After he got there, the crows decided to leave him alone. Again the Robin leaves and the others are waiting for him. The Robin decides that it is much better to stay where he is being protected. The Robin knew that God was watching out for him and that He is being protected. Like that little Robin, he was filled with song and joy where he felt safe. Once he left the protection of the cross, he was going to be eaten and killed. His life was in danger as long as he moved away from the cross and the protection of it. I think life is like that. When we venture away from God, all kinds of horrible things can happen. As long as we have Christ in our life we know that we are going to be OK. God is with us through all the dark moments and the crows in life. For me right now the crows are family. I know that sounds bad. In reality it is. There is a great deal of spiritual warfare going on at my parents home and in a couple of days it will be as if I am going into the lions den. Now, I would prefer to not be like Daniel and the Lions Den, but I know that as long as I have God in my life that He is in control. Worry is one of the areas that many struggle with, myself included. I am always needing to be reminded that God has asked us not to worry but to trust Him completely. There are all kinds of things we have no control over. Lord knows I have tried to control a whole host of things and then it always backfires on me. So, as I go to see my parents and say what I have to say, it is all in Gods hands. I will go armed with the best defense arsenal available to anyone and that is Jesus Christ. I will be updating on how my trip went and I pray to have a wonderful testimony to share when it comes to my parents. If not, I know that God is in control and I can’t make anyone do what they don’t want to do. Only through Christ can things work out. Like that little Robin, he knew where he should be and that is in the protection of God and my faith is in Christ alone. Because of the gift of His blood, I can live forever. I do hope that Robin gets to live longer than tonight.